These professional grade stretcher bars resist warpage. Their tight fitting tongue-and-groove design creates a taut and sturdy support frame for cotton and linen canvas. Each bar measures 1-7/16" high × 2-1/4" deep. Note — Price is per bar, not pair. 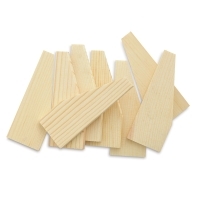 Masterpiece stretcher bars will not interlock with Fredrix brand stretcher bars.